The Effective, Efficient Professor: Teaching, Scholarship and Service develops methods to improve the proficiency and time management skills of faculty in all areas of their careers. Most faculty are discipline experts but have not studied methods to improve their teaching, scholarship or service. This book applies efficiency and time management methods to academe. Throughout the book, the author shows how student learning and academic productivity can be improved by being aware of effective time management techniques. A variety of efficient and effective teaching methods are explored. Scholarship, service, and working with graduate students are also discussed. This book will help college faculty at all levels of instruction take charge of their careers! For college professors in all disciplines. 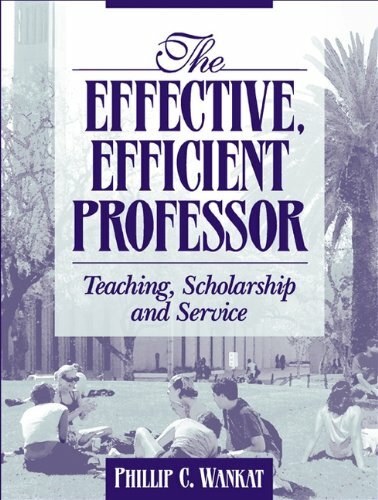 /* 3711L-8, Wankat, Phillip C., The Effective, Efficient Professor: Teaching, Scholarship and Service */ The Effective, Efficient Professor: Teaching, Scholarship and Service develops methods to improve the proficiency and time management skills of faculty in all areas of their careers. Most faculty are discipline experts but have not studied methods to improve their teaching, scholarship or service. This book applies efficiency and time management methods to academe. Throughout the book, the author shows how student learning and academic productivity can be improved by being aware of effective time management techniques. A variety of efficient and effective teaching methods are explored. Scholarship, service, and working with graduate students are also discussed. This book will help college faculty at all levels of instruction take charge of their careers! For college professors in all disciplines.